If screen sharing does not automatically start, touch the Play button at the top of the Screen Sharing page to request view and control of the remote system. You have full mouse and keyboard control of the remote system, enabling you to work on the remote computer as if you were really there. Place your finger on the cursor or drag to navigate the mouse. View additional actions available when screen sharing. Select from additional screen sharing actions and tools. 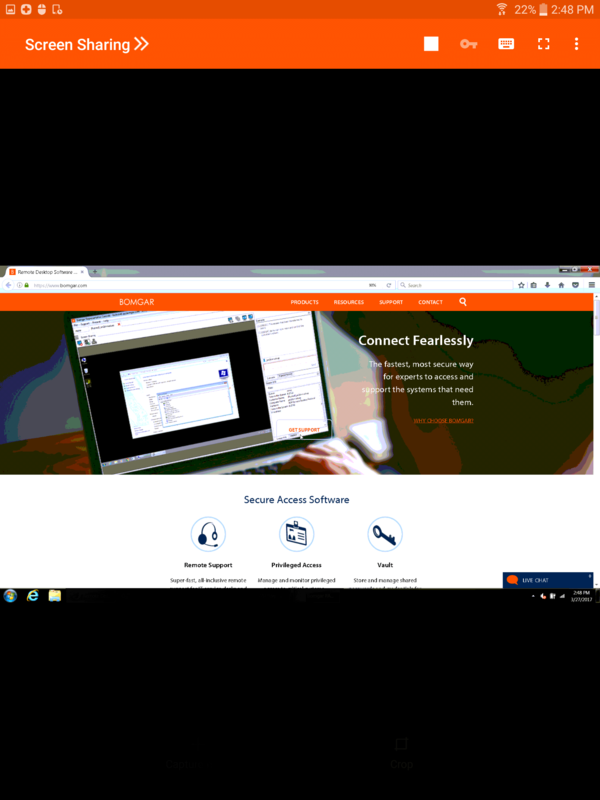 View the remote desktop in full screen mode. Special Actions - Perform a special action on the remote system. Based on remote operating system and configuration, available tasks vary. Paste to Clipboard - Paste items to the clipboard on your device. 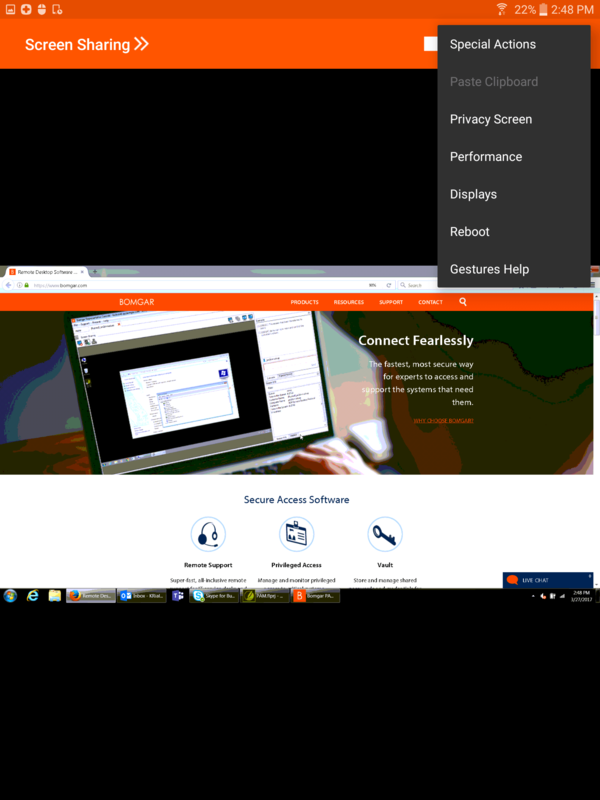 Privacy Screen - Disable the remote user's screen view, mouse, and keyboard input. Restricted endpoint interaction is available only when accessing macOS or Windows computers. Restricted customer interaction is available only when supporting Windows computers. In Windows Vista and above, the endpoint client must be elevated. On Windows 8, this feature is limited to disabling the mouse and keyboard. Performance - Select the color optimization mode to view the remote screen. If you are going to be primarily sharing video, select Video Optimized; otherwise select between Black and White (uses less bandwidth), Few Colors, More Colors, or Full Color (uses more bandwidth). Both Video Optimized and Full Color modes allow you to view the actual desktop wallpaper. Displays - Select an alternate remote monitor to display. The primary monitor is highlighted. Reboot - Tap to reboot the remote system. Gestures Help - Tap to receive tips for navigating the mobile access console.